As any long time fan of Running Wild knows, there has been quite a lot of turnover within this band. Rolf doesn't seem to keep the same lineup in tact for years at a time. Well, some ex members of the band got together during the 1990's and formed a band of their own called X-Wild. Of course, there are natural comparisons to earlier (Under Jolly Roger, Death & Glory) Running Wild, but the band's sound is also splashed with a bit of Accept and Grave Digger as well. 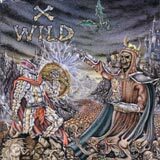 X-Wild plays straight forward, riff based power metal with a keen sense of melody. The riffs are very reminiscent of the Under Jolly Roger and Death & Glory era Running Wild. Axel Morgan fills the album with excellent solo after another for good measure. Most songs are heavy and aggressive yet they all manage to stay melodic at the same time. One difference between this band and Running Wild is that X-Wild mix in some slow tempo songs over the course of the album. For example, Children of The Underground is a haunting slow paced song complete with a children's choir. With Frank Knight's deep, gruffy delivery on this song, it has a very dark and ominous feel. This album also consists of a few mid tempo songs as well as some very heavy songs with an energetic "in your face" quality to them. The end result is a well balanced album with very few boring moments. I might question the decision to follow Children of the Underground with another slow paced song, Dragonslair. Both are strong songs, but the placement of two slower songs back to back dents the flow of the album a bit. The production is certainly very acceptable, although I would have liked to the drums and bass to be just a bit louder. Vocalist Frank Knight is not a typical power metal vocalist with a clean, high pitched delivery. His delivery is much more aggressive and gritty than Running Wild and most power metal bands out there. In fact, he sounds like a combination of UDO and Chris Boltendahl (Grave Digger). His delivery is still melodic and his voice fits the more aggressive songs on this album just perfectly, although I realize the vocals may turn off fans who like more traditional power metal vocals. Savageland is an album that should please most fans of Running Wild, especially those who also enjoy aggressive vocals. Although I wouldn't consider this album a masterpiece, it would certainly be a nice "hidden gem" to anyone who enjoys the aforementioned bands.